Saturday 2 March 2013 marks the first birthday of The Hermitage, the first masterplanned community in Australia by developers Sekisui House. Since its launch in March 2012, over 130 families have chosen to make this popular development their new home. Home bakers and cake connoisseurs have the chance to win some great prizes simply by baking and decorating a fabulous first birthday cake. A panel headed by Eva Campbell, president of the Country Woman’s Association Camden Branch, will judge the competition. 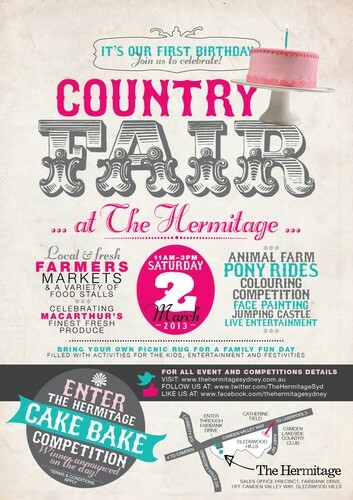 The Hermitage will also transform into a farmers' market with fresh produce from local growers and suppliers such as Camden Community Garden, Common Ground Bakery and Kerrie's Jams and Chutneys. A selection of mouth-watering food including a sausage sizzle by the Camden Lions Club, Turkish Gozleme, ice cream and homemade sweets will be available on the day. Centre stage entertainment will include cooking demonstrations, a live band and performances from local dance troupes.